For farm-to-table restaurants, a segment that counts most contemporary independents and many chains among its number, summer produce literally represents truckloads of opportunity. But while tomatoes, summer squash and stone fruits all provide culinary inspiration, corn occupies a unique place on seasonal menus for the breadth of creativity that it sparks. Unexpected change ups. Fresh corn makes a super starter. The folks at Folk in Nashville provide a fun take on the ubiquitous toast appetizer; theirs is topped with sweet corn, Pecorino Romano and bay leaf oil. Nearby Lockeland Table dishes up an heirloom tomato with charred corn mayonnaise, pickled corn and saba, a grape-based condiment. Some Chicago chefs also use corn as an opening act. The menu at Split-Rail promises “New Americana” like the clever Corn Tots with chipotle mayonnaise and cotija cheese, and Somerset, which calls its food “all American,” concocts a couple of corn-y first courses: Chilled corn soup with blueberries, tarragon and pecorino; and crispy corn & salt cod Fritters with malt-vinegar aïoli. Other chefs use corn to give a tasty twist to their entrées, like the Garden Pesto Pizza at Modern Market, which benefits from summer squash, roasted cherry tomatoes and charred corn, or the Bangkok Shrimp Tacos from California Tortilla, which get a boost from fire-roasted corn salsa. Ethnic mash-ups. Corn is said to have originated in southern Mexico, and many chains exploit this Mexican connection. In the new Mexican Street Corn at California Pizza Kitchen, sweet corn is removed from the cob, roasted with smoked paprika, feta and Parmesan; it’s served with cilantro, lime and ranchito sauce. Lazy Dog Restaurant & Bar plays a variation on the theme with its Street Corn Wheels that are grilled with lime, garlic, queso blanco, Tajín and cilantro. Though corn may be native to the New World, it has long since proved its compatibility with Old-World dishes. The Smoked Sweet Corn Sardi, a pasta special at The Greenhouse Tavern in Cleveland, is finished with corn cream, smoked corn, pancetta and a 45-minute egg. 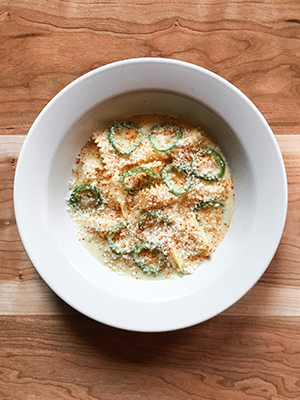 And the popular corn agnolotti at Nashville’s Rolf and Daughters is topped with jalapeño, lime and pecorino. Corn contributes to Italianate side dishes, too, like sweet corn polenta with Sungold tomato, pecorino, peach and basil at Henrietta Red in Nashville or asparagus and corn risotto at SoBou in New Orleans. Speaking of New Orleans, landmark favorite Commander’s Palace keeps its menu up-to-date and appealing with innovative dishes that pay homage to its heritage, like the witty Louis Armstrong “Tamale” that takes its name from the king trumpet mushroom that is combined with jumbo lump crab, smoky red bean purée and roasted corn masa. Classic spiff ups. Many chefs take advantage of consumers’ familiarity with corn to use it as the jumping off point for riffs and revamps. For example, Simon & the Whale in New York City features creamed corn to which are added scallops, bacon and garlic chips. The menu at Kayne Prime, a Nashville steakhouse that generates tons of buzz, features Cream Corn Brûlée as a side dish that receives a flavor boost from roasted jalapeño. Also in Nashville, the kitchen at Geist, which recently opened in a former blacksmith shop, plates maltagliati pasta with a sous-vide egg, pecorino and corn pudding. Mezze, or small plates, at Butcher & Bee in Charleston, S.C., include succotash, the traditional corn-and-lima-bean combination enlivened at the restaurant by the addition of field peas and cotija; while the mezze menu at its sibling operation in Nashville boasts sweet corn with butter, serrano and Herbsaint, the anise-accented liqueur. The fact that corn grits are integral to Southern cookery may mean that they are on the menu all year round, but that doesn’t make them immune to innovation. Highly lauded Highlands Bar & Grill in Birmingham, Ala., offers Stone Ground Baked Grits with prosciutto, mushrooms and thyme. At Grace & Grit in Mt. Pleasant, S.C., diners can enjoy a grits flight whose sweet-and savory components change through the year; current options are blueberry, pimento cheese, coconut cream and Brussels sprout pesto. Elsewhere on the bill of fare are creamed corn hushpuppies with a hot honey drizzle. Corn is naturally sweet, so it gives a boost to desserts like Grace & Grit’s Grit Brûlée made with coconut cream grits and vanilla bean custard and topped with raspberries; or the caramel popcorn sundae at Highlands Bar & Grill made with polenta pound cake, sweet corn & blackberry swirl ice cream and almonds.